Published: April 29, 2016 at 08:13 p.m. Updated: April 29, 2016 at 11:20 p.m. The Titans traded for running back DeMarco Murray this offseason. Now they've already drafted his replacement. Tennessee selected Alabama running back Derrick Henry with the No. 45 overall selection in the NFL Draft. It's a surprising pick because Henry is such a similar player to Murray, but no NFL coach loves anachronistic smashmouth football more than Titans coach Mike Mularkey. At 247 pounds, Henry doesn't have the greatest feet. He's not going to make defenders miss, but he's a decisive one-cut runner who can make big plays if he hits the open field. His skills on passing downs remain a question mark. Tennessee has the luxury to draft at a position without a great need because they have so many picks. 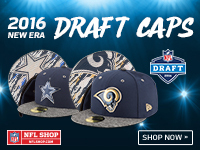 They had three second-round picks, and took Clemson pass rusher Kevin Dodd (No. 33) and Penn State nose tackle Austin Johnson (No. 43) with the other selections. The Titans then took Middle Tennessee safety Kevin Byard at No. 64. The Titans are definitely attempting to get tougher. General manager Jon Robinson telegraphed this pick in February, saying that he wanted a bruiser. We thought the Titans filled that need with Murray, but Robinson wanted to bulk up this offense even more.